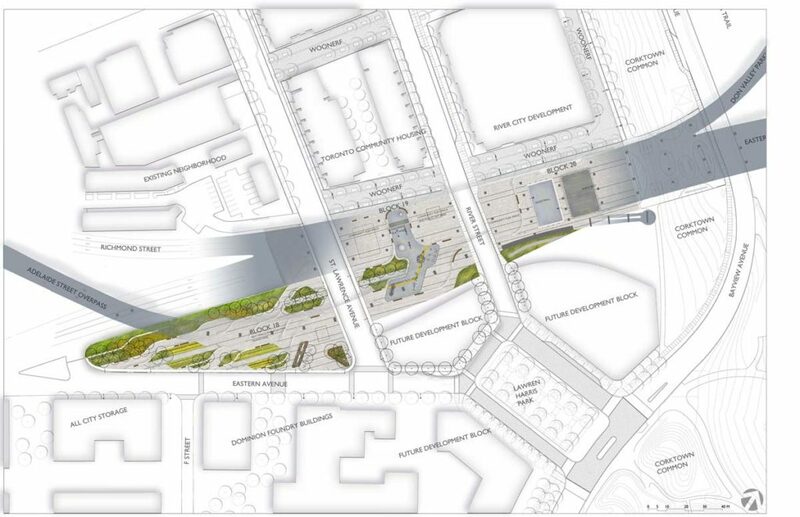 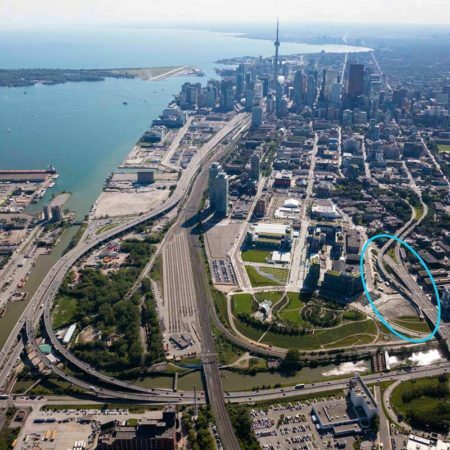 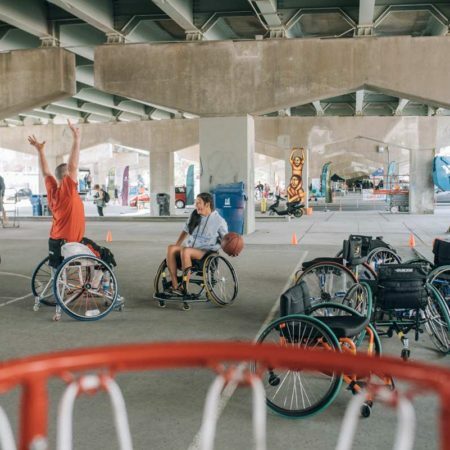 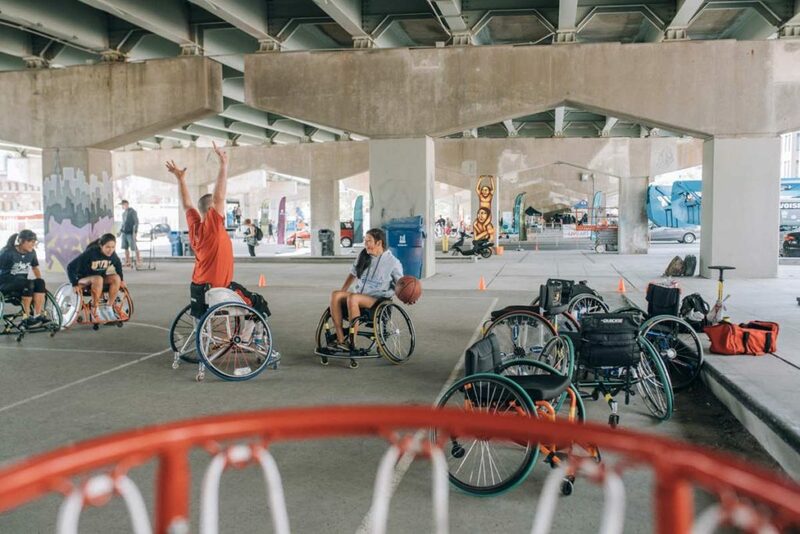 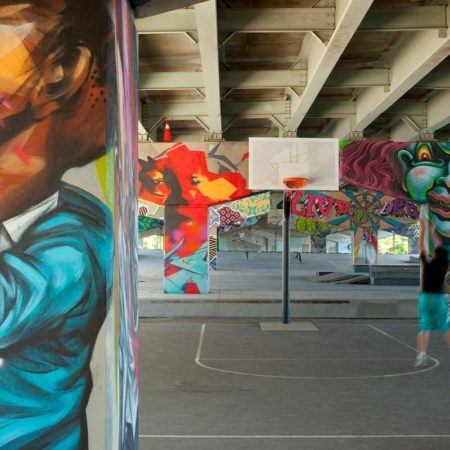 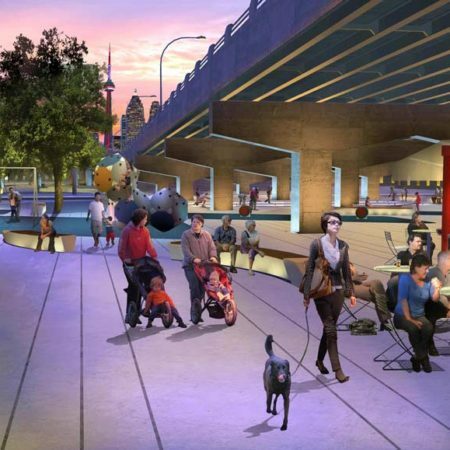 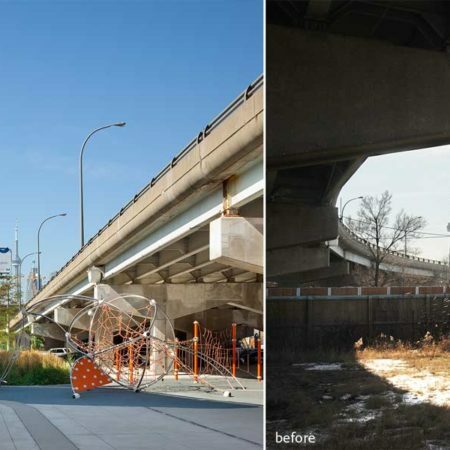 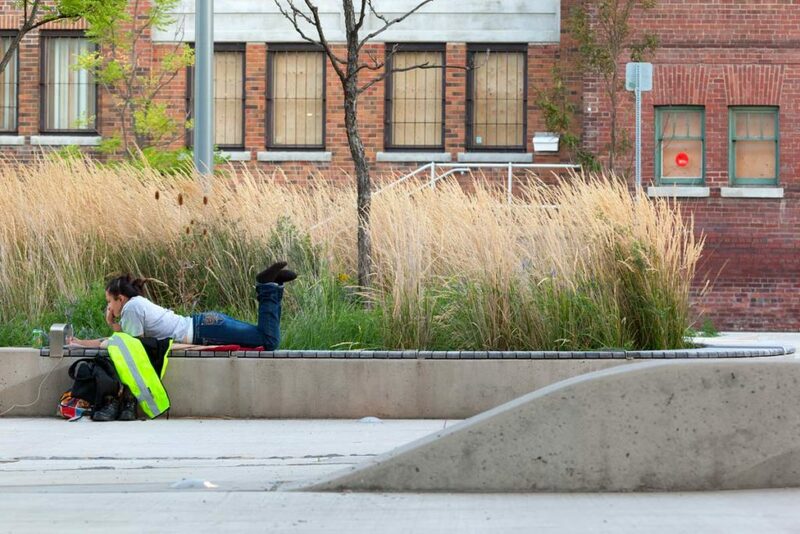 As part of Waterfront Toronto’s extensive revitalization efforts of former industrial lands into the new West Don Lands neighborhood, an opportunity was seized to take an incidental, neglected space located below the three low lying overpasses, and to transform it from a liability into a community asset. 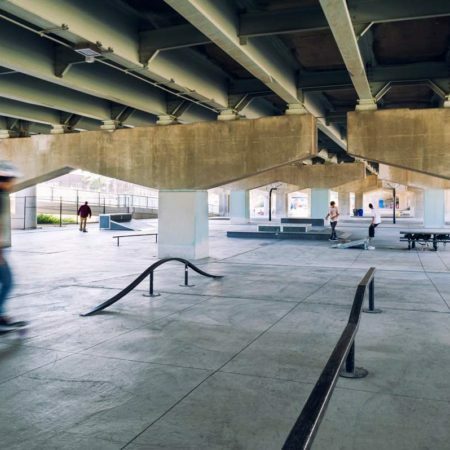 Largely ignored or avoided by the general public, the existing site was forlorn and even dangerous space used for informal parking, illegal activities and little else. 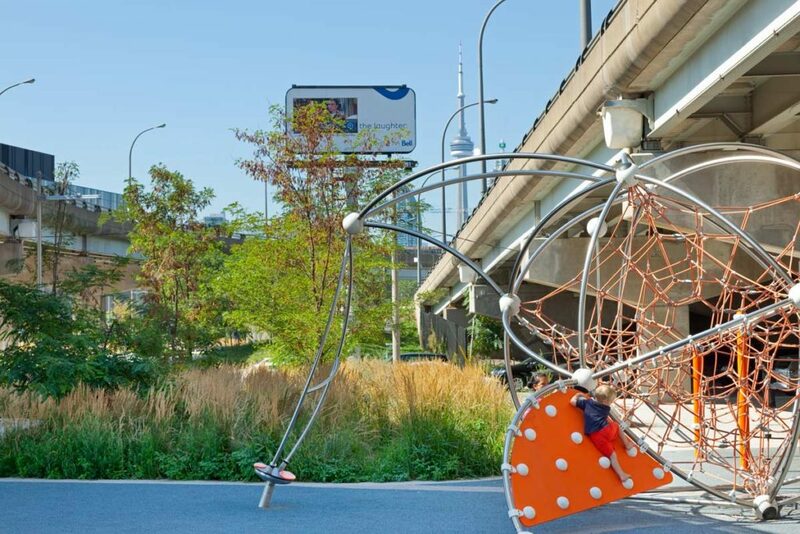 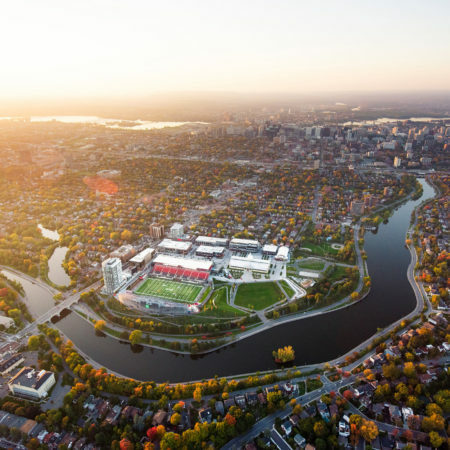 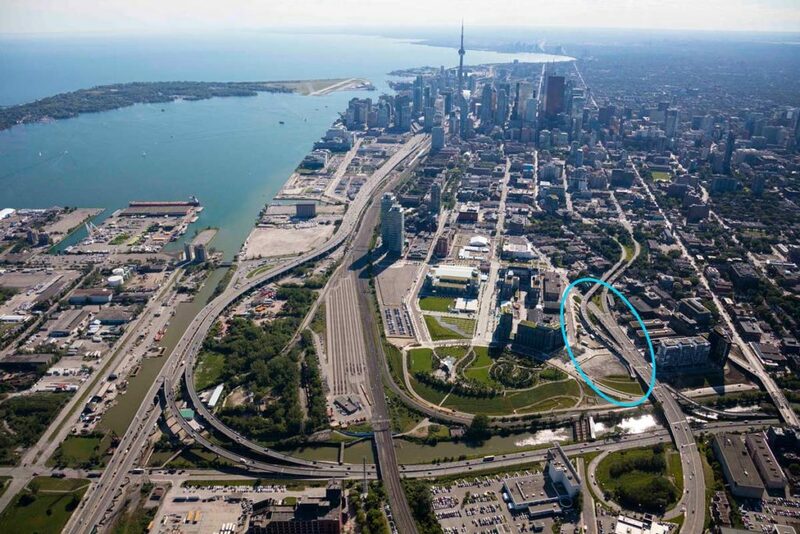 The 2.5 acre (1.05 hectare) park now serves as one of two key parks in the new community, linking Corktown Common, River Square and the two main development areas of the neighborhood – that are bisected by the overpasses- into a lively and complete community in Toronto’s eastern downtown. 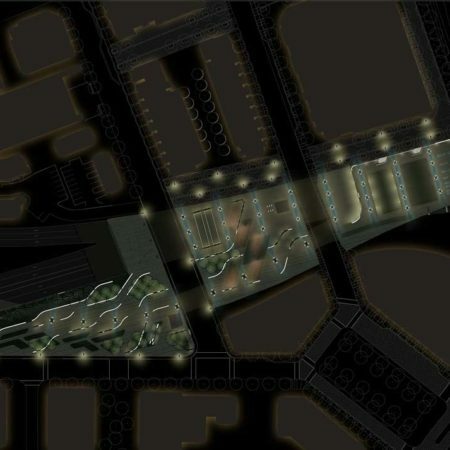 Completely transformed, the success of the project lay in the recognition of the latent potential found in the existing supporting structure, its repetitious – almost hypnotic – grid of heavy columns and beams and the varied pockets of open space that resulted from the road geometries above. 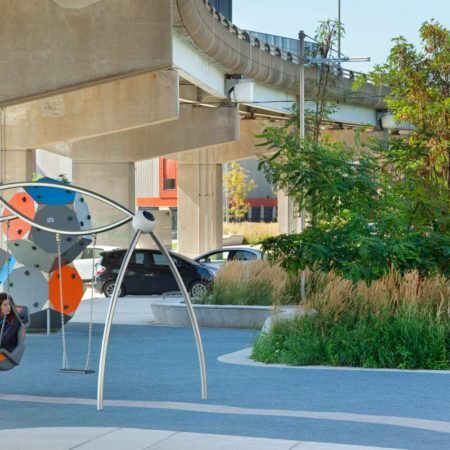 The spatial framework and programming choices for Underpass Park was inspired by the rooms created by the transportation infrastructure. 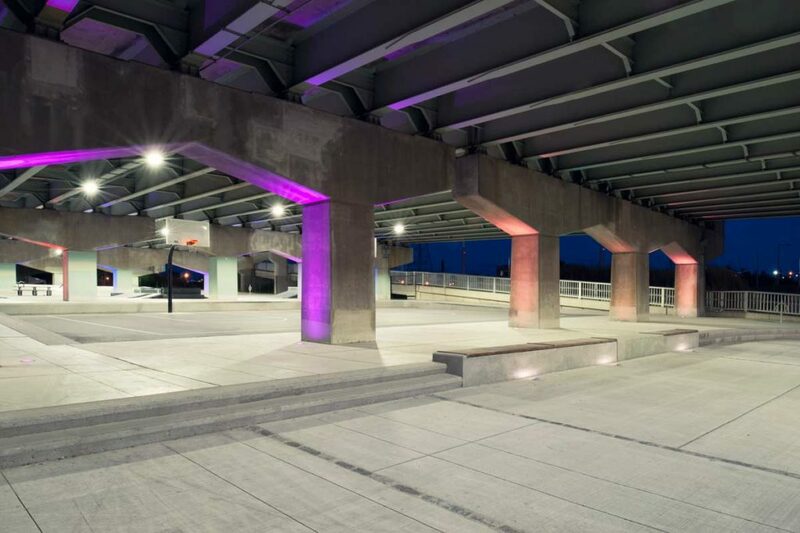 Essentially serving as massive weather protection, the ceilings of the overpasses now invite year-round animation and allow activities such as basketball, roller hockey, and skateboarding to happen day and night and during inclement weather, something very familiar to Torontonians. 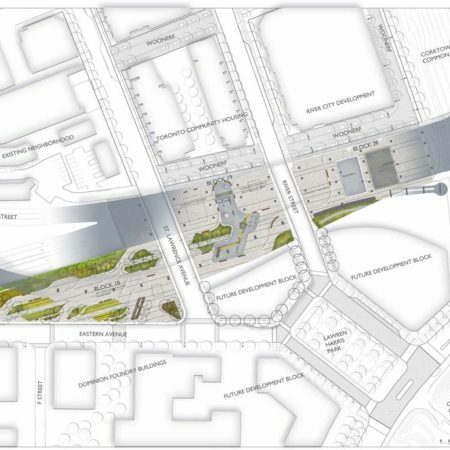 Previously a brownfield site dominated by the heavy grey concrete structures, densely planted areas along the edges and in the voids between the overpasses have transformed the site from grey to green. 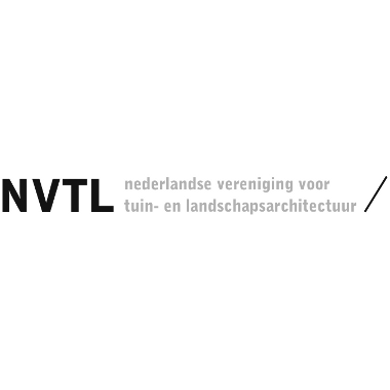 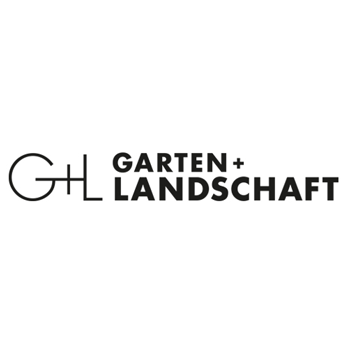 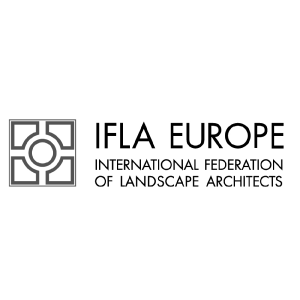 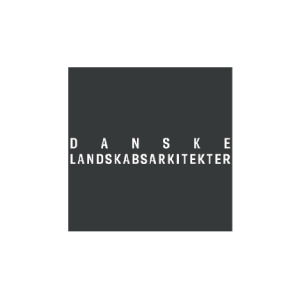 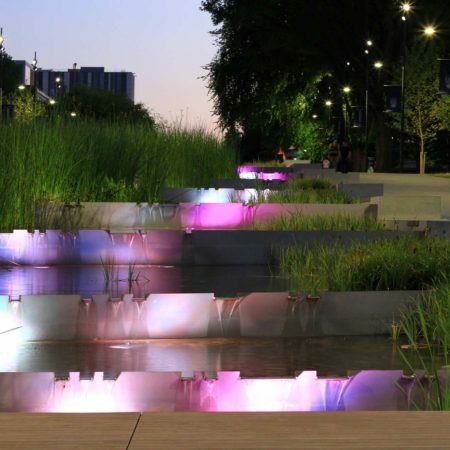 Plants were selected for their ruggedness and ability to withstand harsh urban conditions while providing a layer of fine texture and ephemerality to the site. 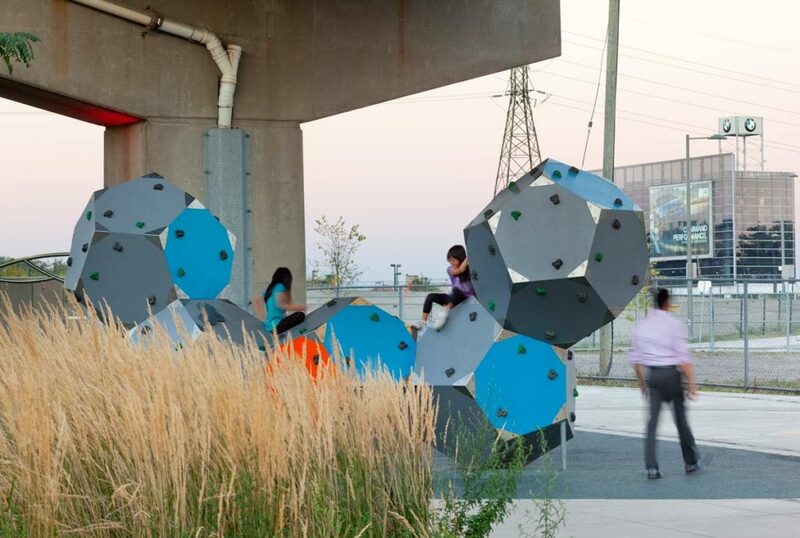 While much of the space was left open for circulation and flexible activities, a carefully composed layer of multi-functional ribbon-like wall structures were added to help define various activity zones, provide seating and to direct movement throughout the site. 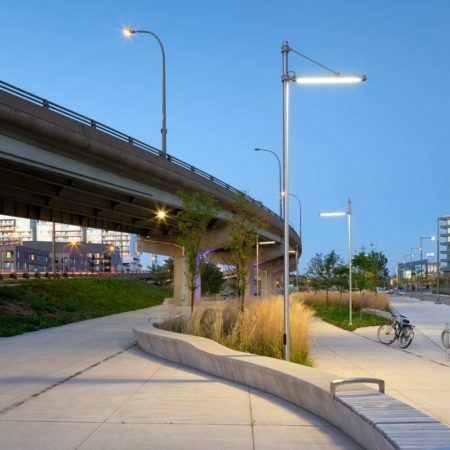 The wood-topped bench components of the underlit walls offer a warm counterpoint to the hard and heavy lines of the existing infrastructure. 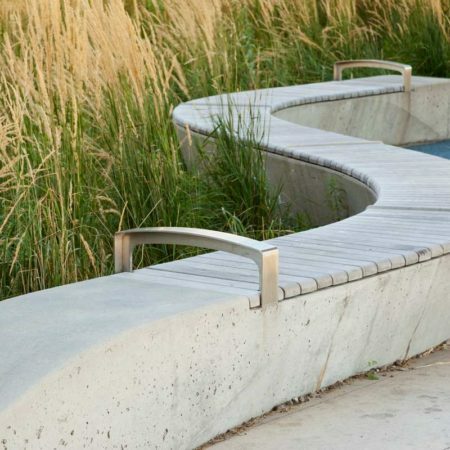 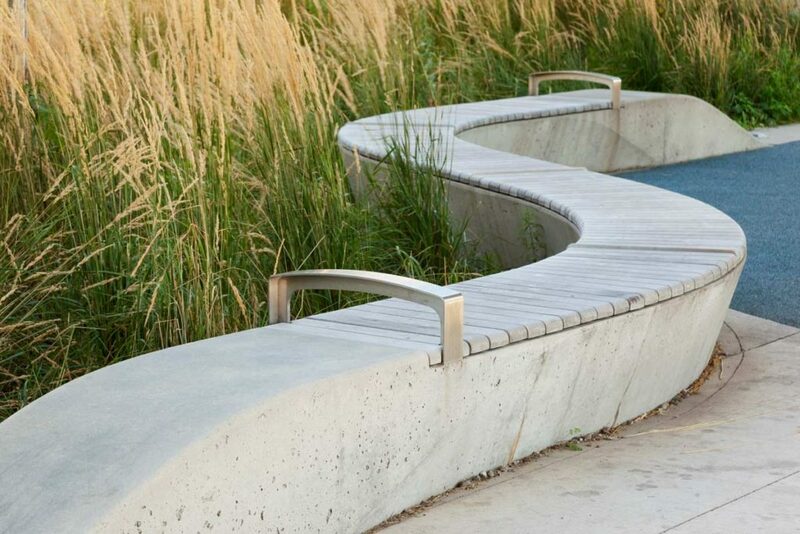 The playful vertical and horizontal undulations of the ribbon walls add visual interest and play opportunities while the associated tall grasses and regional species provide hints of “wild” within a strictly urban setting. 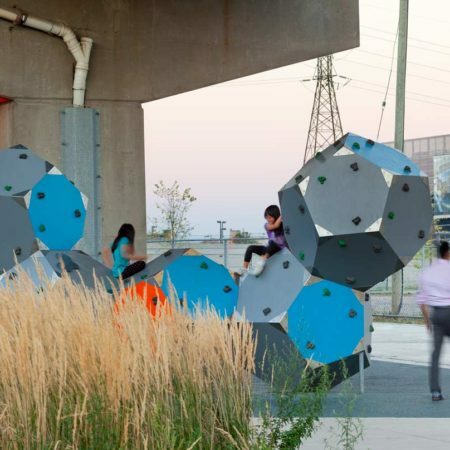 A layer of fanciful children’s play elements are speckled throughout and contribute to the transformation of the space through color, form, and program. 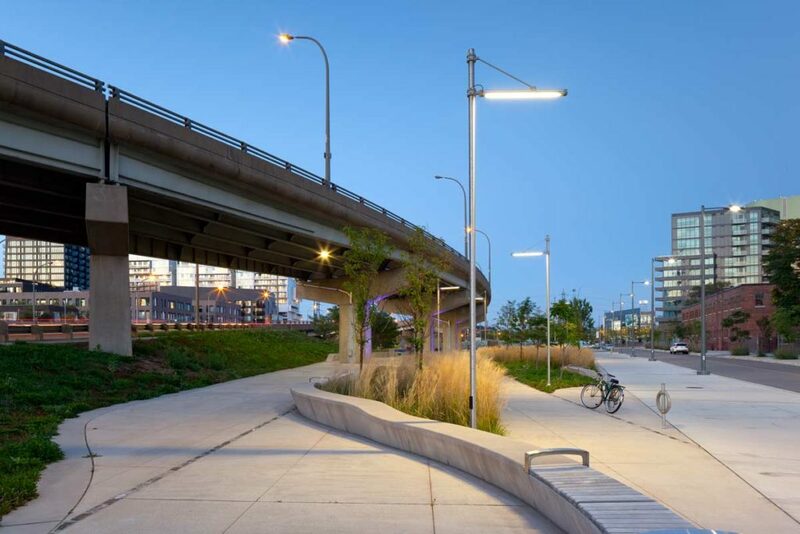 One of the most significant transformative strategies was the element of programmed LED light which plays both an artistic and functional role at the park. 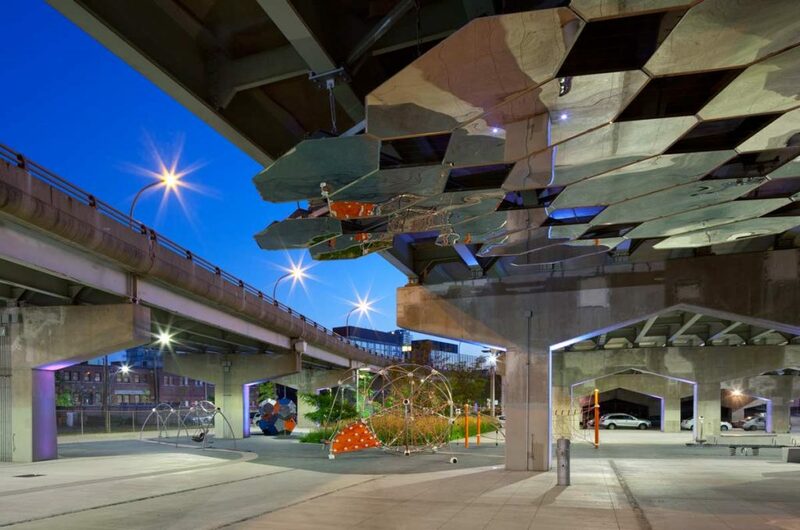 Existing column archways are uplit in bright colors that draw attention to its depth and repetitive makeup, providing an animated night experience and aiding in wayfinding and a sense of safety. 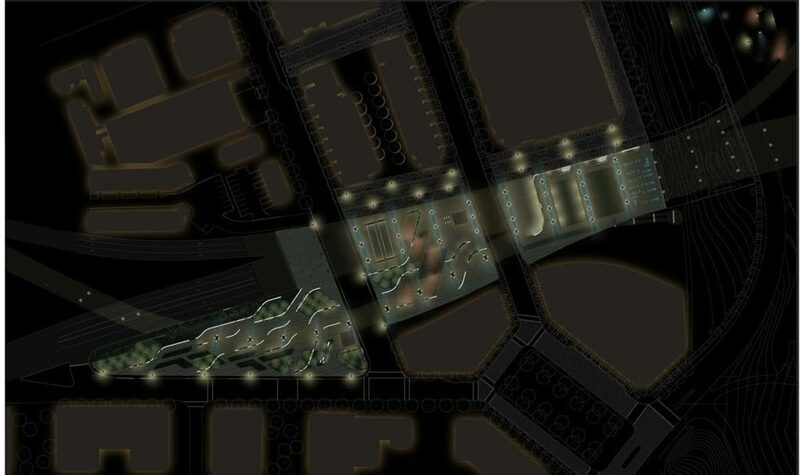 A public art layer was integrated into the underside of the structure to interact with the lighting scheme and to reduce the oppressive character of the heavy structures above. 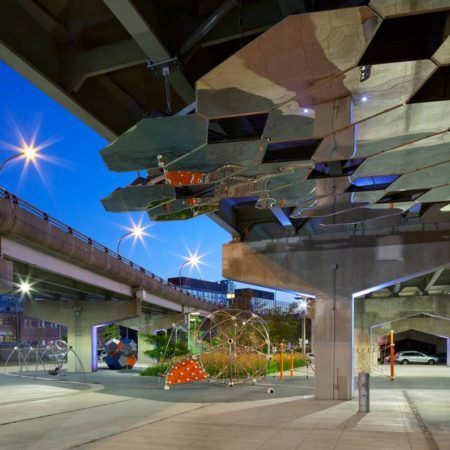 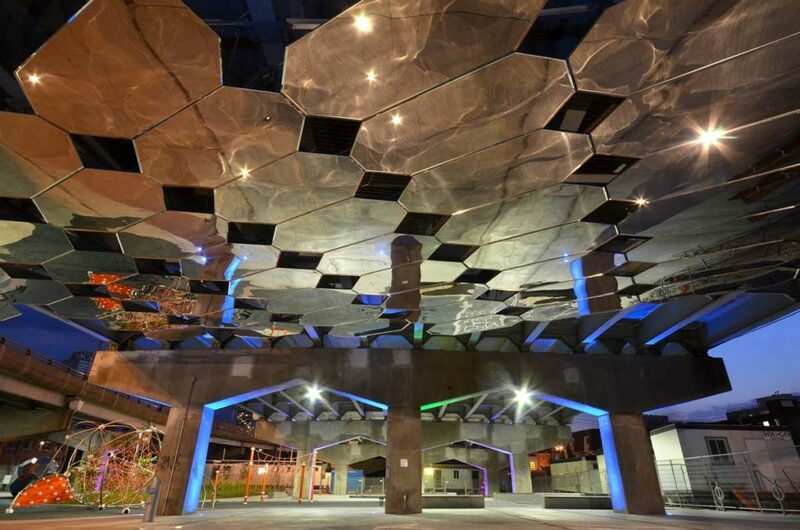 A portion of the overpass ceiling is now adorned with a reflective public art piece, Mirage, created by Paul Raff Studio. 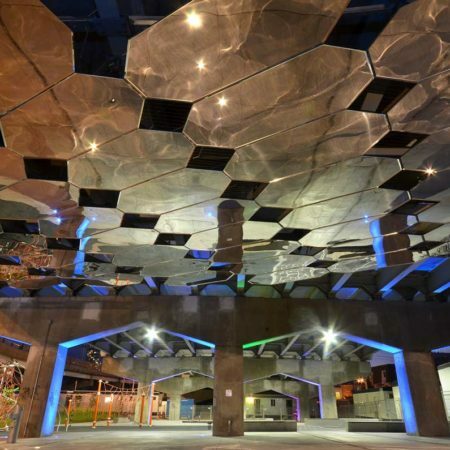 This mirrored artwork dramatically brightens the covered spaces and adds to the experiential unexpectedness of the space. 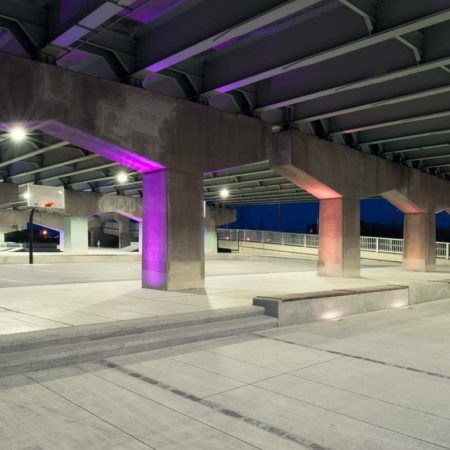 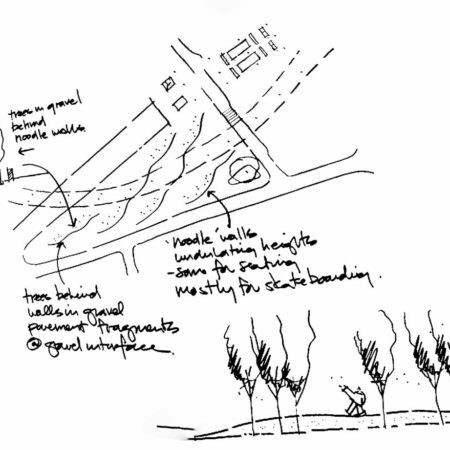 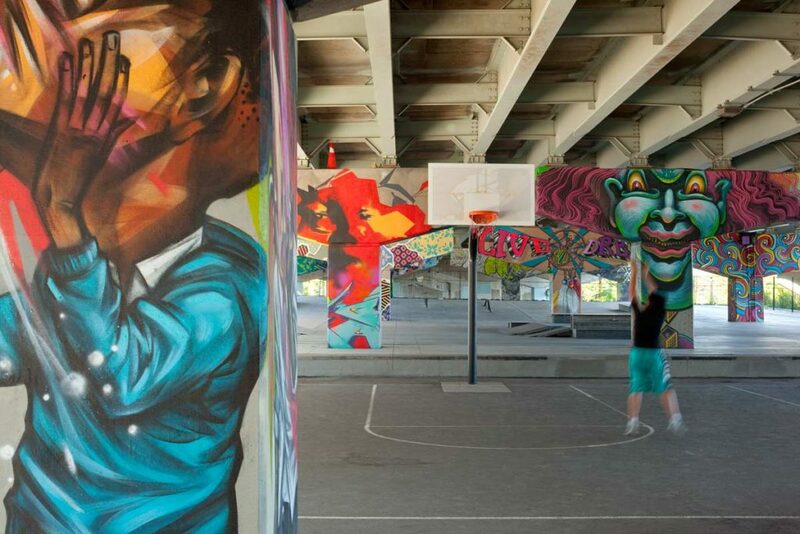 Through its multi-dimensional programming, flexible framework, and bold transformative gestures of light and public art, Underpass Park has proven itself as a unique public space that serves not only as a safe and beautiful community connection, but as a recreational destination for the city. 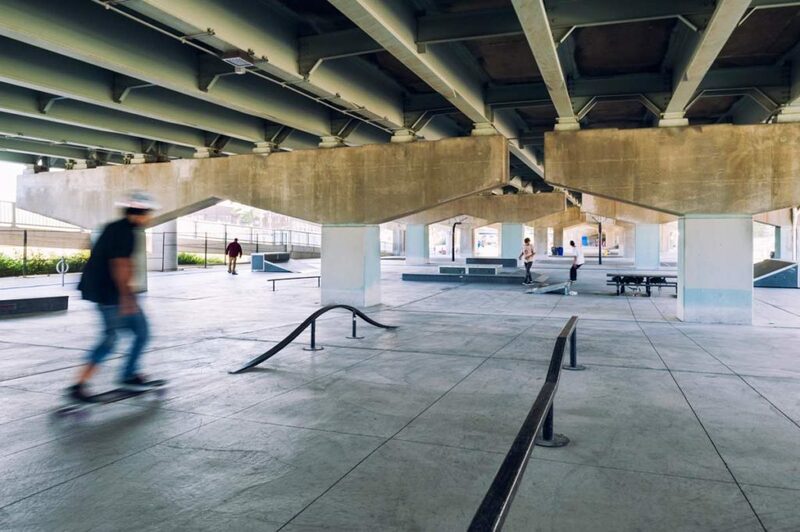 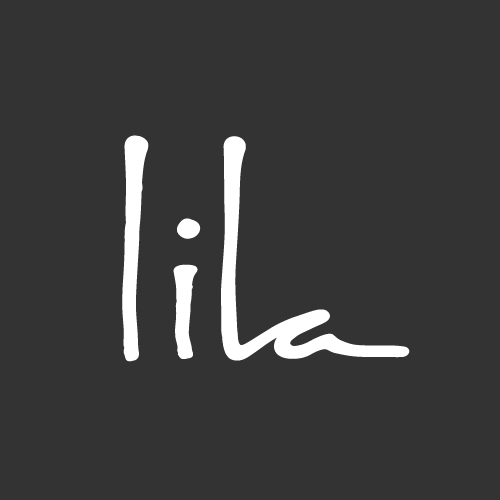 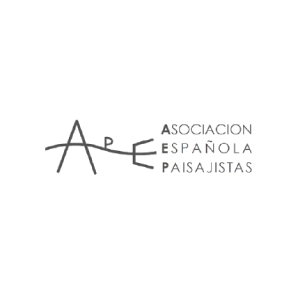 Both community amenity and urban stage set, the park has also found itself being used as a venue and backdrop for numerous artistic endeavors including spontaneous performances, skateboarding events, dance routines, music videos, and fanciful commercials. 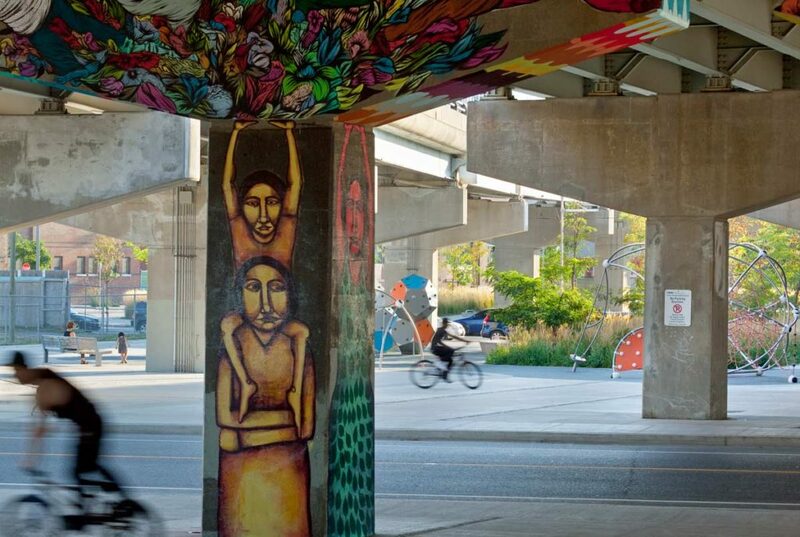 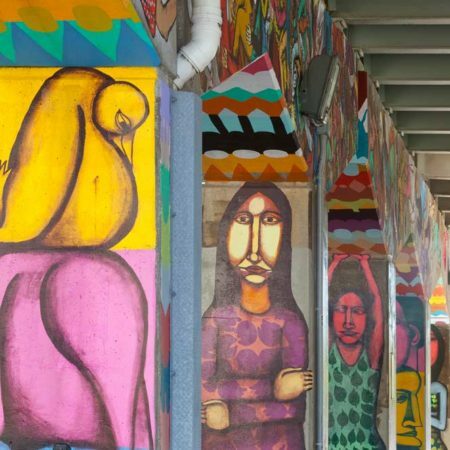 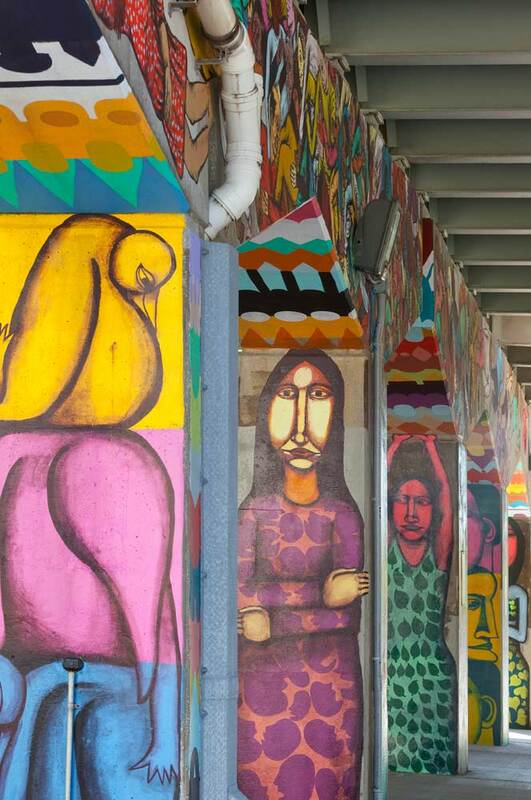 Graffiti is celebrated and encouraged on the existing pillars, creating a unique and vibrant informal urban gallery. 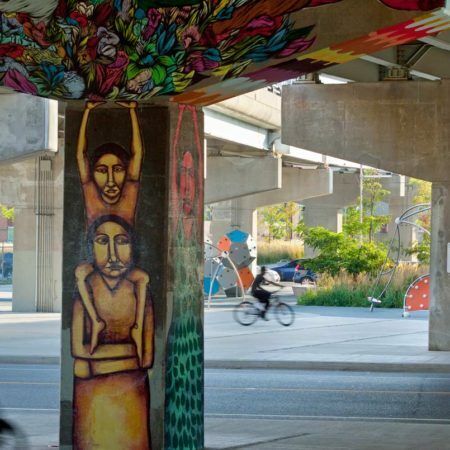 This initiative, to have a variety of artists contribute their talents to brighten the space, was spearheaded by a group of organizations—including StreetARToronto, Mural Routes, the Corktown Residents and Business Association, and Friends of the Pan Am Path. 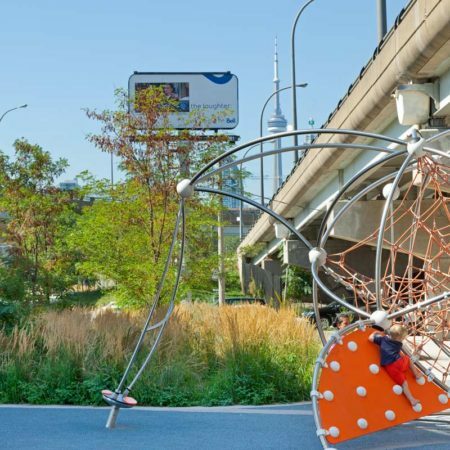 The resulting gallery of bright colors and diversity of styles defines the park as a truly collaborative community space that encourages user participation and fosters ownership in the transformation of this public space. 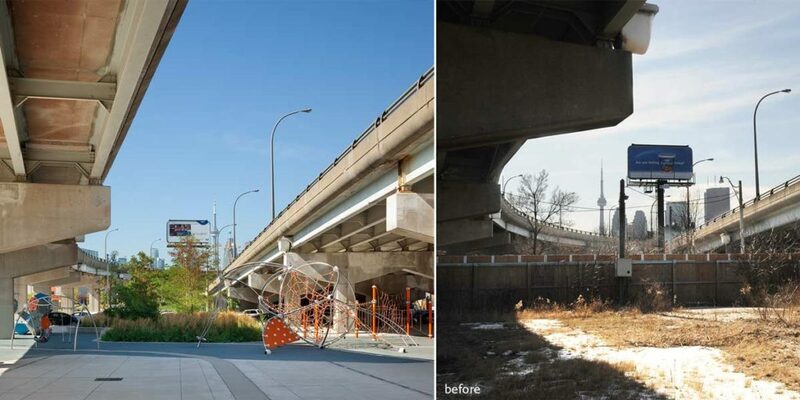 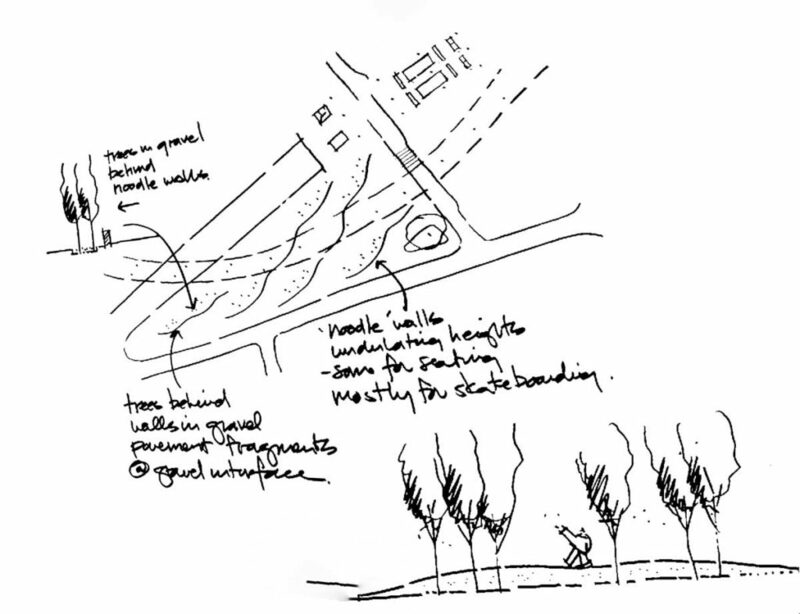 Underpass Park is an important example of how a left over space can be transformed and knit back into the urban fabric of a city in a manner that positively contributes to a city’s open space network. 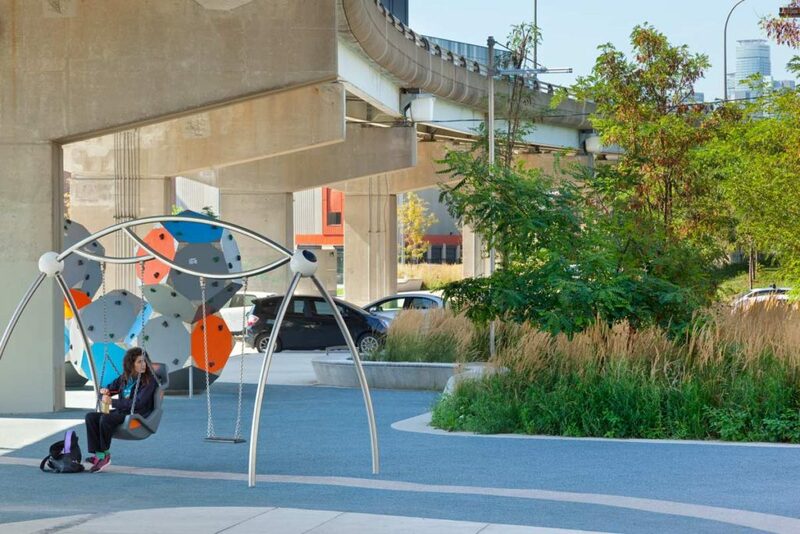 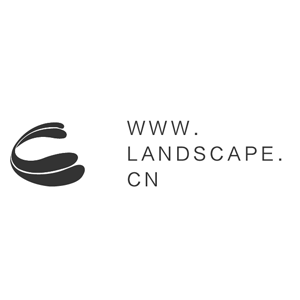 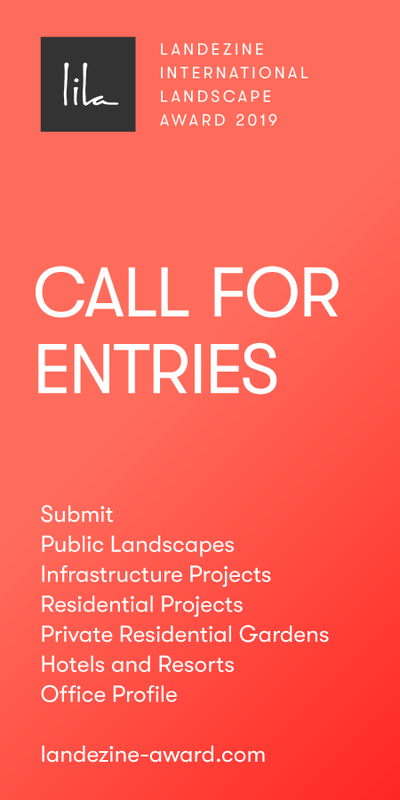 As urban densities continue to increase and more conventional public spaces become rare, it is critical that landscape architects look at unwanted and overlooked places and extract their potential to become vibrant and valuable components of our public realm.